Beer Friday done live again after some confusion last set of days off as to whether I would be gone or home. It turns out I am home and that means I'm off as of yesterday evening which allows a beer review to be done in a rare Lonebiker exclusive Live event spectacular. A small crowd has even gathered outside! Imagine that? Chants of "Beer Friday"were yelled every time a car would pass as the crowd hoped to see some sort of sign of maybe a pourer, back up pourer or perhaps even an intern! As for the first day off? No rides sadly, just vehicle shopping for one of the Jr Lonebiker family members, it seems the older I get the faster the day travels which is a true bummer. Cause you know what that means? Death is lurking around a soon corner. Oh fack! I didn't just go there did I? This just got very dark in a hurry. Here! I'll save it right now with this video.. 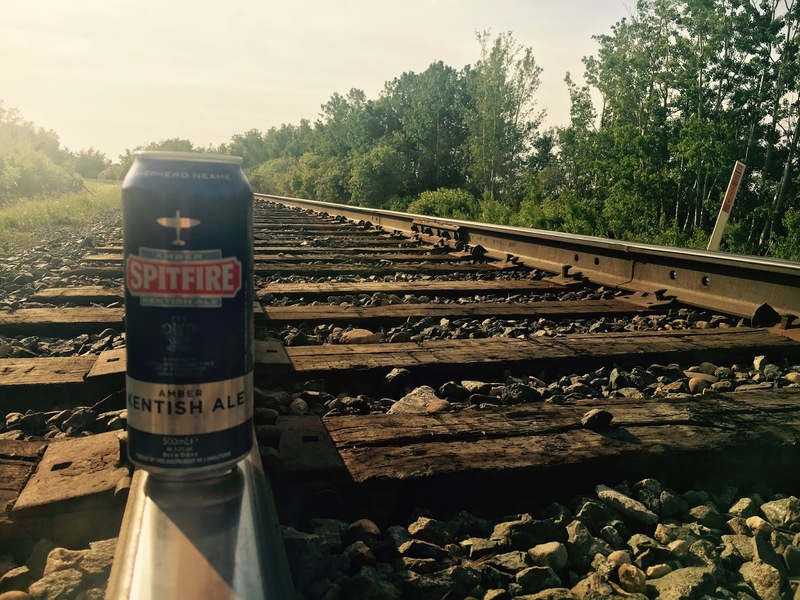 This beer was named after perhaps the greatest fighter plane in the history of the world. The Spitfire. One of the heros of World War Two this plane flown by the bravest pilots who helped fight off the Germans in the battle of Britain. A dark and terribly scary time for England.The brewery behind it is Shephard Neame. Founded in 1698. Holy shitballs! What did I just type!? Sixteen-Ninety-Eight.... Just let that sink in for a minute or two. Think of how old that is. Understandably the cool factor in this beer just went up ten fold. We won't let the old cool bias come into play during judging will we? Nope. We are professional. The beer which was named in honour of the Spitfire was poured and a golden murky brew filled the tester glass. A one and a half fingered head appeared and soon went away like a dark shadow on a night ride. The first sip was taken and we were a bit taken back as it seemed to be a tad watered down. Or is this how North American jackasses review beers without a full understanding of what goes into making them? The strength is low to low moderate. Some earthy tones come into play but nothing that comes with a resounding wallop to the mouth. The website says it's high on the bitter but I'm not getting that in any way. What is this is to me? A gentle lad of a drink to be had before bedtime while reading the BBC news on your iPad. Its subtle and quiet, much like the British were thought to be in World War Two. Or maybe not.. Not great but historic. The Union Jack on the top is a nice touch I'd say.. This beer (sadly) gets 2.5 suds out of 5.